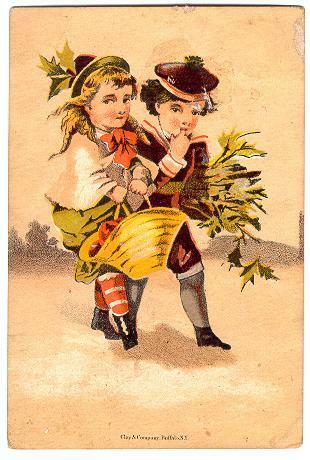 This Victorian trade card or greeting card shows a girl carrying a basket of fruit and a boy with an armful of holly boughs. It was made by Clay & Company, Buffalo NY. It measures approximately 3 x 4-1/2 inches. The card has minor corner tip wear and mild toning. It has adhesive residue at the corners on back, as well as an approximate 1/2-inch chip at the upper right edge. The lower right corner tip has a shallow pressure crease.